Not all Wedding Shower Ideas are created equal! Come take a look and you will see what I'm talking about. It is said that bridal showers grew out of an early practice where a financially underprivileged family might not have the means to provide a dowry for their daughter or when a father decided not to give his daughter a dowry because he did not approve of his daughter’s choice for a husband. 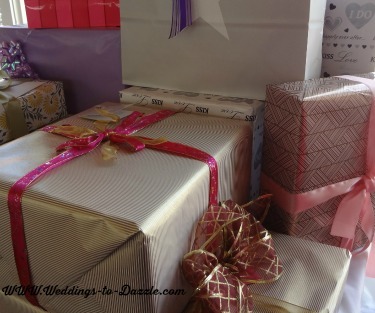 In those instances, friends of the bride would have a get together and bring gifts to the bride in lieu of a dowry. Today’s wedding shower is usually hosted by the bridal party, the bride's mother or a close female relative of the bride. 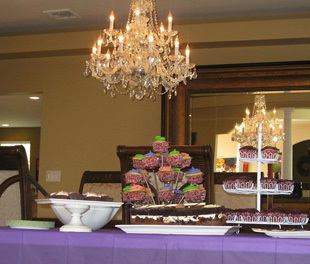 Wedding shower ideas are endless but one idea that I would like to share with you is what happened at my bridal shower. My maid-of-honor invited my fiance and me to her house for dinner one Sunday afternoon and asked me to pick up a cake that she ordered at a particular restaurant. Unbeknownst to me, all the guests were seated in the front room of the restaurant and when I walked up to the counter to get the desert, all of the guests jumped up and yelled, “Surprise.” Wow, I was shocked!!! Today there is no limit to the creativity of the hosts. Take a look at the above picture. The shower was held in a house and the decorations were fabulous. 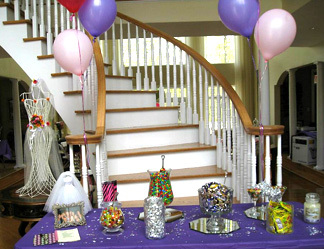 Notice the candy jars decorate the table and serve as favors for the guests. The wire silhouette of the bride in the left part of the picture is so simple yet opulent. The invitation to the wedding shower is important because it sets the tone of the shower and lets the guests know the date, time, place, who the host is and how to RSVP. Wedding Shower Ideas - Cake or Cupcakes? Everyone loves cake and a shower cake is no exception! The above beautiful cake was created by using two square cakes with flowers serving as a cake topper. 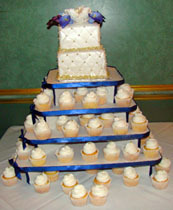 Cup cakes on a tiered pedestal were then placed next to the cake. If you prefer to leave the elaborate cake till the wedding day, consider these scrumptious cupcakes as an alternative to a cake. A popular wedding shower idea is for the host to choose a few games for the guests to play as entertainment at the shower. A fun game to play is to ask questions about the bride and groom and see which guest answers the most questions correctly. A purse scavenger hunt is another fun game to play. Divide the guests into groups and then ask each group to produce certain items, such as a lighted key ring, a calculator, picture of the bride and groom and so on. To make this game more fun, you can assign a point system for each item in accordance to the likelihood of someone actually having the item or you can assign the same value to each item. The group with the most points wins. This game is a great ice breaker for the guests. The host can give out small gifts such as, pads, pencils, pens or candy to the winners of the games. Prior to the shower the host should make a list of items that she will need to help the bride while she is opening her gifts. Tape, a scissor and plastic bags for the discarded wrapping paper are a must! Don’t forget that the bride will want to write a personal thank you to her guests for sharing in her shower and for the gift that they brought. So, the host can assign someone to make a list of the gifts that the bride opened with the name of the person who purchased it for her. Most people enjoy looking at pictures, so a nice idea is to bring pictures of the couple as they were growing up and as a couple. The pictures can be in albums or in frames placed at the gift table. Wedding shower ideas are endless and with all the excitement of the shower, don’t forget to relax and have fun.